Oh my goodness! I miss my baby! She has been in the hospital for six days now. My parents offered to stay with her this weekend since I had to work and so that Brock and I could both be with Tate and Evie for a couple of nights. It’s the first time since her diagnosis that I have not been with her. Scarlett’s temperature went down for most of the day today. Her urine sample was sent to Children’s Hospital and her oncologists consulted with the team there. We now believe that she may have viral hemorrhagic cystitis – an inflammation of the kidneys and urinary tract that causes bleeding. Because it is caused by a virus there is nothing that can be done to stop it. It may also be caused by the cyclophosphamide that she has been receiving. Her counts are down even more today. The 6-mercaptopurine that she received every night on days 1-14 of the cycle is the medication that suppresses the bone marrow. It usually reaches it’s lowest point on day 7-10 after the dose. It has only been 5 days since her last dose so it may be another week before we reach the lowest point. Her red blood cells were down again today after her transfusion. Her platelets were higher because she just got a transfusion yesterday. Her white blood cells are down to 400. Unfortunately, they are all immature cells so they don’t fight infections. Her ANC (a measurement of her immunity) is at zero. This means that she has no immunity whatsoever. She will no longer be able to have visitors. 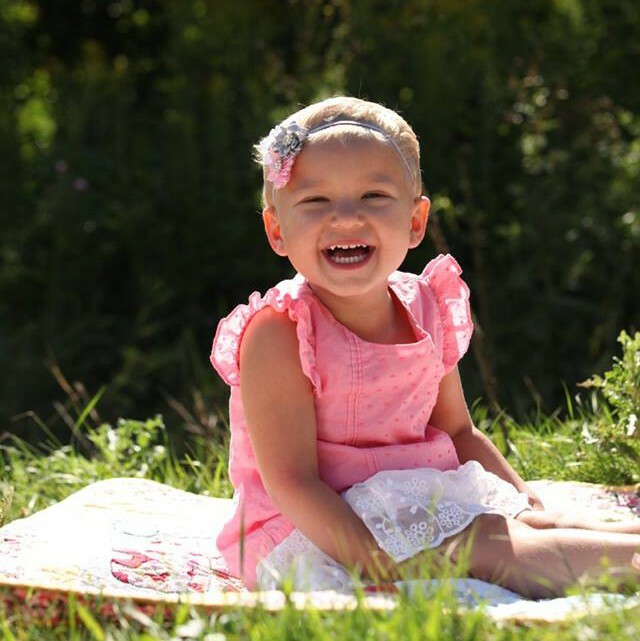 The best case scenario for her treatment is to have a 28 day cycle of chemo. Her ANC has to recover to a level of 750 before we can start her second 28 day cycle. I really doubt that she will have recovered enough in the next nine days to start this next cycle. It is scary to think that she is any further behind in her schedule than she should be. I don’t want to give this cancer any extra time to come back. But she needs time to heal and get better. Her body needs a rest. She has been complaining of pain a lot. We don’t know if the pain is from her (unknown) infection, a side effect of the medication, or her bone marrow kicking in. She cries when I raise her hips while changing her diapers. This could be because her kidneys hurt if they are infected or it could be because there is a lot of marrow in her hips. She has been saying that her ear and her mouth hurt. She doesn’t have any sores in her mouth so her doctors are thinking it’s actually her jaw that hurts. This could be a side effect of the cyclophosphamide or it could be because there is a lot of marrow in her jaw. I either curse the damn cyclophosphamide or I praise her marrow hard at work. Please, please let it be the marrow! We really need some good news for a change. Brock and I are home tonight with the kids. I made Scarlett’s bed. A simple chore that was so much more. I had tears in my eyes as I put her freshly washed sheets on her bed, lay her Princess Sophia comforter on top and put her princess pillowcase on. Her bed is so lonely at night without her. It’s so difficult to tuck Evie in at night and then walk out of the room without going to Scarlett’s bed. It’s so sad to eat dinner and not hear her squeaky little voice. We don’t have her car seat in the car right now and it is so sad to look back there and know that she’s not with us. Evie carried her pretend cell phone around tonight. As we listened to her talking we heard her say “well hi Scarlett! How are you doing?” It’s very heartbreaking to know that they won’t get to see her now for quite a while. Our house is not a home without all of us together. Our castle is missing its princess. Scarlett now has her name on the door at the hospital. I have always felt heartbroken seeing that. It means that that child has been there for a while and will be for longer. Anything to make them feel a little more at home. I want her to be happy and comfortable but in no way is that room her home. She needs to bring her little name sign and pictures to her castle. We need to stop living out of a suitcase. We need her in her princess bed. And, most importantly, we need her in our arms. I miss my baby!